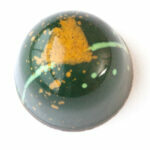 Our artisan bonbons and truffles are little pieces of edible art. 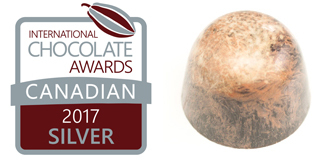 We use the best and freshest ingredients, and import/source the finest chocolate available, to make perfectly delectable delights. 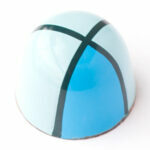 Note: All of our chocolate bonbons contain fresh ingredients and are best enjoyed within 3 weeks of purchase. 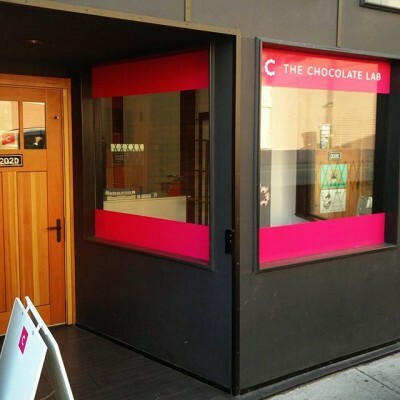 We welcome you in one of our stores, or you can shop online and have our chocolate shipped right to your door. 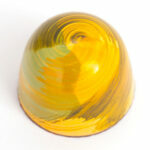 Passionfruit infused white chocolate ganache, layered upon a pistachio and white chocolate ganache. Fresh and flavourful! The Dean makes a triumphant re-entry. 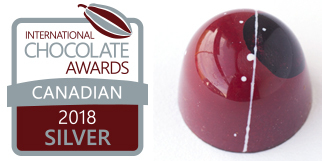 This award-winning bonbon features origin Peru dark chocolate, paired with a Bourbon Manhattan cocktail, complete with a kirsch soaked cherry. 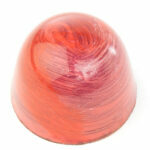 A cranberry gelée rests upon a Central American origin dark chocolate ganache, infused with pink peppercorns. 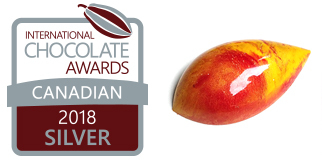 We import the finest Tahitian vanilla from the source, and pair it with a silky white chocolate ganache, layered upon an exceptional PNG origin dark chocolate ganache. 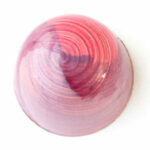 A black current gel is layered on a dark chocolate ganache, origin Honduras (Lake Yojoa), infused with current and cassis. 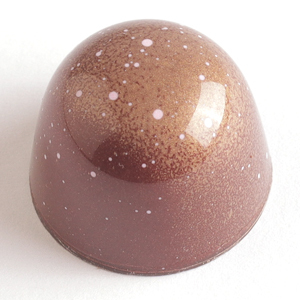 A single plantation Brazil origin dark chocolate paired with house made ginger syrup, and a warming blend of spices, including ginger, nutmeg, and cinnamon. 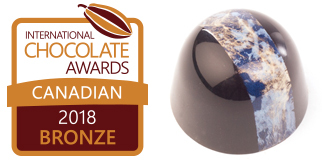 A beautiful and distinct blend of origin dark chocolate from Brazil, El Salvador, and PNG, paired with an award winning Rye Whiskey that is infused with Italian leather and Brazilian walnuts. 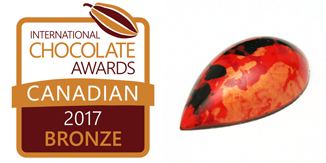 Japanese Shichimi Togarashi infused into our signature Cassonade milk chocolate, paired with a beautiful asian citrus blend. 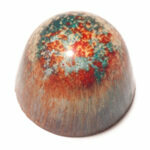 A fragrant and beautiful rare single estate Dominican origin dark chocolate, with citrus undertones. 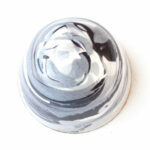 An exceptionally smooth dark chocolate ganache. What April showers bring. 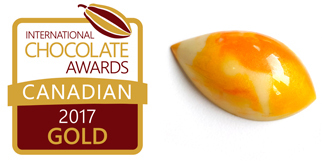 Silky white chocolate is infused with a beautiful floral blend, including Jasmine and Hibiscus, and is topped with a peach compote. 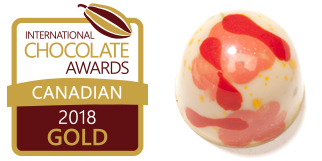 This festive bonbon features a cranberry caramel, layered with origin Mexico dark chocolate that is infused with Sichuan red pepper. Made especially for caramel lovers. 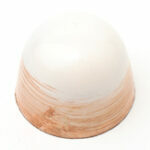 Three layers of caramel with milk chocolate, and a touch of salt, with caramel crunchy pearls. Contains gluten. 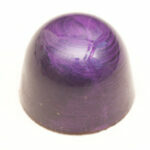 English lavender and wild blueberries are infused into a white chocolate ganache. A vanilla caramel is layered on a buttered popcorn and white chocolate ganache, and finished with a salted pretzel and chocolate wafer. Contains gluten. A three layered piece celebrating the other drink of the gods, coffee. 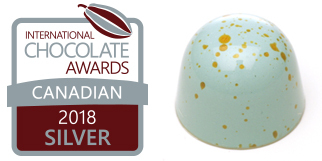 Dark chocolate is paired with locally roasted espresso, with a middle layer of caramelized white chocolate, and finished with a crunch layer of dark chocolate combined with crunchy cacao nibs. 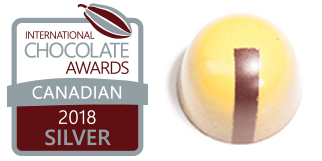 Inspired by Belafonte’s banana boat, this three layered bonbon uses white, dark, and milk chocolates, featuring flavours of bananas, Jamaican rum, and crunchy caramel. Contains gluten. Say hello to your new love. 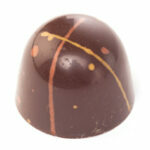 This bonbon features origin Venezuela dark chocolate paired with local honey, for a deep, rich, chocolatey experience. 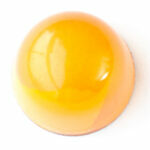 Remember chasing the ice cream truck down the street for that creamy orangey goodness? 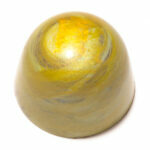 This bonbon features a white chocolate ganache, infused with orange and cream. 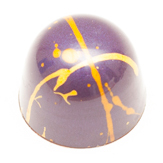 This piece features silky white chocolate paired with lemon and passionfruit in one layer, and fragrant yuzu in the other layer. 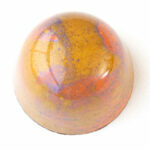 Chai spice with cinnamon in a 41% milk chocolate, that brings back memories of travels to distant lands. 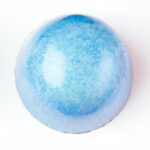 A beautifully fragrant bonbon that features white chocolate ganache in layers, infused with lychee and floral blossoms. 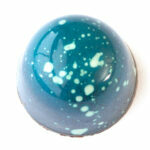 Grand Cru Matcha is paired with vanilla, and infused in white chocolate. Single origin Peru dark chocolate, paired with a classic Old Fashioned cocktail. 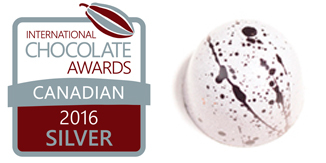 Our premium Or Noir milk chocolate paired with a Rob Roy cocktail. Origin Peru dark chocolate paired with the Bijou cocktail. 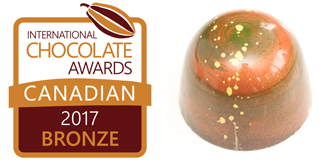 Single origin Dominican Republic dark chocolate ganache paired with the Hop Toad cocktail. 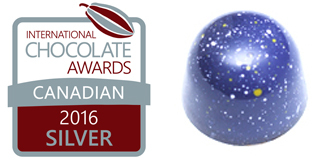 Our premium Or Noir milk chocolate paired with a McKinley cocktail . 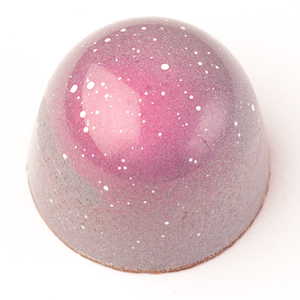 Silky smooth white chocolate ganache infused with raspberry and rose, paired with the Rose cocktail. 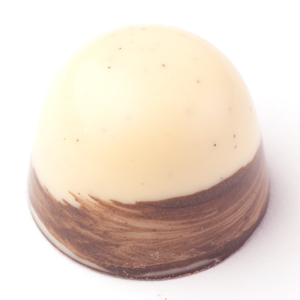 Layers of white chocolate, and Origin Ecuador dark chocolate ganaches paired with the Santiago cocktail. Origin Ecuador dark chocolate paired with the Suburban cocktail, with a lemon gelée. 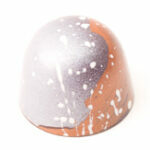 A blend of origin Peru dark chocolate and Ghana milk chocolate, paired with the Waldorf cocktail. Ingredients: cocoa mass, sugar, cocoa butter. 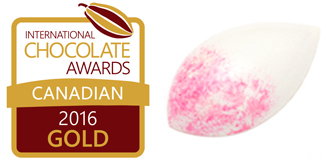 May contain: milk, wheat, barley malt flour, soya lecithin, vanilla, fruit, alcohol, colour, cacao nibs, salt, nuts, honey, natural flavouring. Created in a facility that works with peanuts, tree nuts and wheat products. 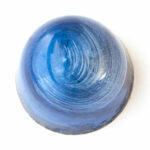 Organic, natural, direct trade, and fair trade ingredients are used where possible. Ingrédients: pâté de cacao, sucre, beurre de cacao. Peut contenir: lait, blé, farine de malt d’orge, lécithine de soja, arôme naturel de vanille, fruits, alcohol, colorant(s), grains de cacao, sel, noix, produits des noix. Crée dans un établissement qui entrent en contact avec noix, arachides, and produits de blé. Ingredients biologiques, naturel, commerce direct/equitable sont utilisé si possible.